Zhu said that the BRICS group – which includes Brazil, Russia, India, China, and South Africa – should ensure that the bank will provide services as soon as it is launched. >>> The whole East versus West propaganda campaign is aimed at giving the hypnotized public a fairytale storyline for all the changes they’re going through. It also offers them scapegoats on whom they can pin all their problems. The international bankers are going to crash the current system and blame it on the Federal Reserve, then they’re going to introduce the BRICS as the heroes who save the day. 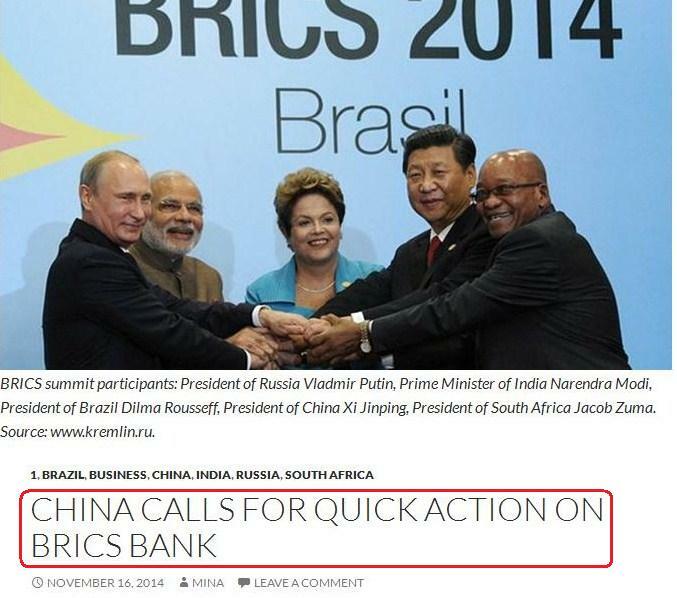 > The NDB was scheduled to start lending in 2016, but as of this weekend all the BRICS nations suddenly want to “speed up the process to have it completed as quickly as possible” so “the moment the bank is launched it will be able to immediately carry out (financing) processes.” And the BRICS finance ministers have been instructed to put the Bank’s president in place by the time of their next meeting in Russia. > The next BRICS Summit in Russia will be their 7th summit, and it will occur in the 7th month of next year (July 8-9). Although I personally view numerology as spiritually ridiculous, the “elite” and their minions do not, as was evidenced by Christine Lagarde’s infamous statement on the numerology of the year 2014 (in which she talks about the “magic 7”). In the eyes of some mythical religionists, 7 is believed to be a symbol of “completion.” It is also believed to indicate “the senses of a change after an accomplished cycle and of a positive renewal.” So the 7th Summit would be a symbolically appropriate venue for announcing the launch of the NDB. 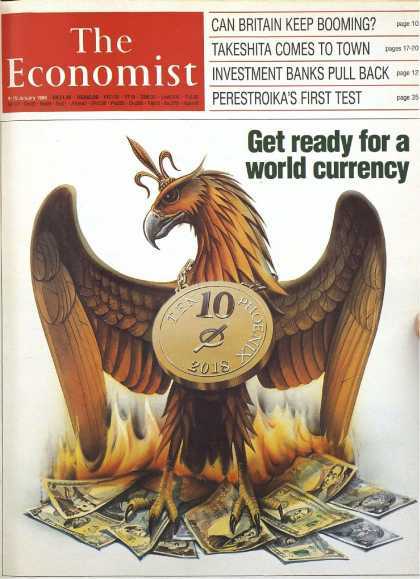 The globalist banksters have advanced the planned date for the New Lehman Moment from 2016 to the second half of 2015. …or so the globalists believe. You have to break a lot of eggs to make an omelet, and you have to lay down mountains of bodies and oceans of blood to impose a world government. Therein lies a problem for the globalists: after doing all the terrible things necessary to pressure the peoples of the world into your new order, how do you get them to accept it as the solution to all their problems instead of seeing it for what it really is (the source of all their problems)? You institute a change in management, that’s how. 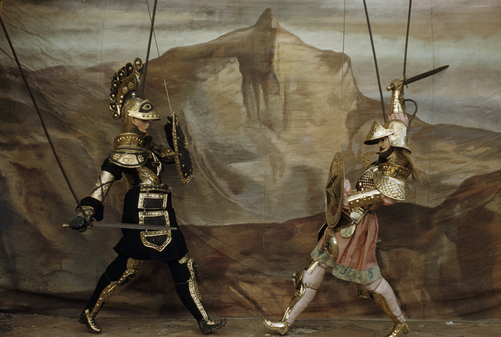 To make the change in management work requires an extensive perception management campaign. You must get people to invest all of their grievances into the existing management (the scapegoats) while simultaneously investing all of their hopes into the new management (the saviors). And once people see the scapegoats as the source of all evil and the saviors as the source of all good, the saviors must be seen to forcefully wrest control of the global government from the goats. 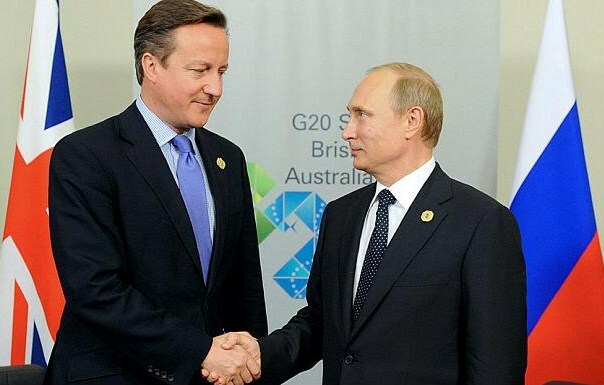 If the handover of power were easy and orderly, it wouldn’t look as real to the people. It is for this reason that the globalists have been intentionally airing all the dirty laundry of the West while trumpeting the virtues of the East, and it is for this reason that you hear so much talk about “governance reforms of the global institutions.” Once the “good guys” (the East) are publicly seen to take over the globalist complex from the “bad guys” (the West), the global government will be seen as a force for good rather than a force for evil… or so the globalists hope. Allow me now to piss on their dreams. This passage portrays the multilateral BRICS Bank as somehow being competition to the globalist complex, when it is actually the exact sort of “functional arrangement” the Rockefeller New World Order plan calls for. It also hints at the need to change the governance of the WB and IMF, including this telling little clue: “it is unfortunate that the Americans and Europeans have led the IMF and the WB since their creation in 1944.” I’ll explain why they added this in the next update. “We support the improvement of the current international economic and political order…” Here, he is flat-out telling us that China supports the existing globalist complex of the UN / IMF / World Bank, but is demanding “improvement” in the form of a “greater voice for emerging economies (the BRICS) in global governance.” So the saviors are making the “demand” of governance changes, eh? Quelle surprise! And once that “greater voice” has been achieved, the globalist complex will be a positive thing for humanity, right? Of course, the scapegoats will not meet the saviors’ demands, and this is why the Republican election victory was essential to the global governance change agenda. As this article mentions, “[South African Finance Minister Nhlanhla] Nene said US President Barack Obama told the G20 he will do all he can to get Congress to approve the IMF reforms. He blamed the holdup on his political opponents.” This engineered political gridlock within the US will be widely proclaimed as the reason why the world must move away from a reserve currency that is subject to any one nation’s political vagaries, and it will give the saviors cause to start wresting control of the multilateral institutions from the goats. 2015 will be a very dramatic year. When talking about the Fed raising their interest rates, he basically says to “do it for the seniors.” Since the article is about money and savings, I guess there was no way he could work in “do it for the children,” or I’m sure he would have 🙂 . In light of the “as soon as possible” rhetoric coming out of the G20 Summit, I find this recommendation quite interesting. It may be the first salvo in a propaganda setup for an earlier-than-expected interest rate increase that will start the economic train wreck. Let’s keep our eyes peeled for more rhetoric featuring the phrase “as soon as possible” or some variant thereof. On a hunch, I decided to check if the post-G20 preconditioning propaganda included any reference to the globalists’ “Audit the Fed” gambit. As it turns out, it did. 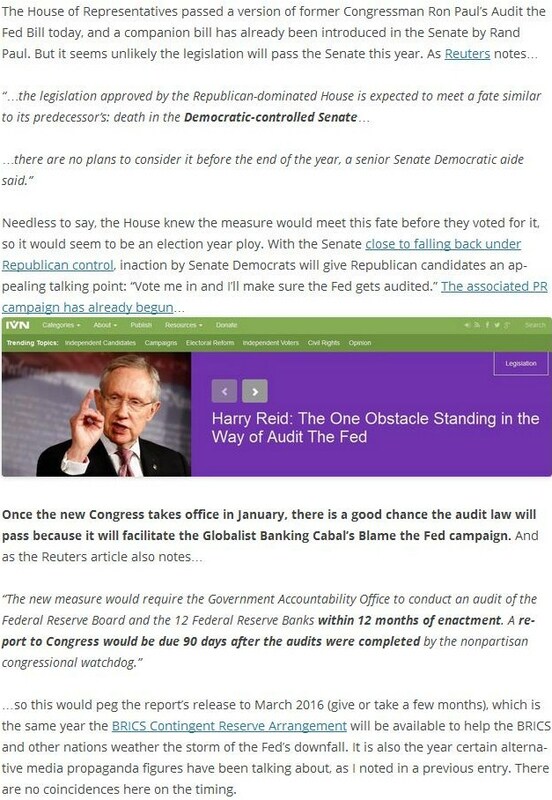 >>> “Audit the Fed” is here to stay. So as expected, the Fed will be examined and all the skeletons in its closet will be laid before the public for all to see. This is a necessary part of the globalists’ “Blame the Fed / Promote the Multilateral Institutions” strategy for bringing in the NWO. > Audit the Fed will pass and strategic leaks from the audit may find their way into the news during the remainder of the year. > The Fed will “mistakenly” raise interest rates “too soon” and perhaps “too steeply,” resulting in an economic domino effect. > Fallout from the Fed interest rate decision will culminate in a New Lehman Moment (which might start in Japan, given all the media talk about their fragile condition), the effects of which might drag on into 2016 (just like the first Lehman Moment in 2008 caused ripples that lasted through early 2009). The New Lehman damage paired with the results of the Fed audit may result in the Fed’s downfall sometime around March 2016. In estimating the time of the New Lehman Moment, occult numerology and the “Magic 7” come into play. Considering that the first Lehman happened over the weekend of September 13, 2008 (a Saturday), which was 7 years after September 11, 2001, the New Lehman may be slated for the weekend of September 11, 2015 (a Friday), which will be 7 years after the first Lehman. The two Lehmans can be looked at like the twin towers — first one falls then the other, resulting in total destruction of the old system. In the next update, we’ll have a look at China’s Zhou Xiaochuan, the man who will take Christine Lagarde’s place as IMF Director once the saviors take charge. This entry was posted in NWO on November 19, 2014 by kenneth.